Arriving at Frideswide Square via the station or the bus, face The Oxford Hotel and on the right hand side is Hollybush Row. 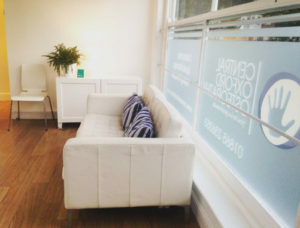 It’s less than a 5 minute walk to the clinic on the corner of St Thomas Street and Hollybush Row. Nearest carparks are Oxpens, Westgate centre, Worcester Street. Note there is an hour’s free parking outside, but please make sure you don’t go over time. When you arrive at the clinic please ring the bell marked “Talking Therapies”. Ock Street links Abingdon town centre to the Marcham interchange. If you are coming from the A34, you will see the fire station on your right, then sheltered flats and then an office block with an archway to a rear carpark. This building houses the Complementary Healthcare Practice. Park around the back and come straight into reception, no need to ring the doorbell. Park in or near the market place in Bampton. Find the Co-op, and the coffee shop. Moonraker Lane runs down the side of the coffee shop. Skype or Zoom is available for other times.